What Are Your Long-Term Care Plans? Many of us know that long-term care is expensive. It’s not uncommon for families to have to pay upwards of $100,000 or more per year for the care of one elderly relative. The cost goes up if there is more than one. Most people can’t afford to spend that much money in one year. Obviously, wealthy Americans are going to be in the best position financially to pay out of pocket for these expenses, but long-term care can put a burden on even their bank accounts. With enough advanced planning, however, most families will be able to take the burden of long-term care in stride. Most Americans will eventually require some sort of long-term care after they reach the age of 65. Despite those odds, most adults fail to plan for the future by purchasing long-term care insurance, set up a trust, or take other proactive steps to protect their future care. Long-term care planning, however, should be a top priority for most of us. It is about restricting, protecting, and stretching your assets so you and your family can get the most out of your benefits and assets. 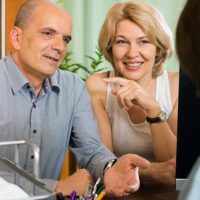 Elder care and estate planning attorneys can help you plan to make your assets last for the duration of illnesses and other situations that arise, especially if those costs aren’t covered by Medicare. Years ago, people would simply create a will and that was enough. But as laws and times have changed, a simple will isn’t enough. As a result, advanced directives (powers of attorney), Medicaid planning, living wills, and other tools have been developed to protect you in ways that were never even thought of just 30 years ago. There are several things that need to be addressed when preparing your long-term care plan. First of all, you need to establish your legal needs. You should speak with an elder care or estate planning attorney and make sure that your legal needs are met. This will include preparation of documents such as a durable power of attorney, healthcare surrogate, and living will. Next, after speaking to an attorney, you may need to talk to other professionals such as accountants and bankers. Finally, you will need to determine how you plan to pay for long-term care. Do you have insurance to cover the cost or private funds? Should you learn more about wealth preservation planning? Planning for our long-term care needs is not something we like to think about, but it is imperative to think about such things well before we ever need them. Tampa attorney David Toback has decades of experience helping people make plans for their future. He will help you achieve peace of mind by setting up a long-term care estate plan that will educate and empower you. You will feel confident in knowing that all of your questions and concerns have been taken care of and that you have a plan for the future. You will be able to rest assured knowing that you and your family will be taken care of when the time comes. Contact him today to schedule a consultation and start planning now.